Tired of Losing and Misplacing Important Text Data or Document Files? 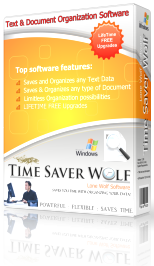 Time Saver Wolf makes Text Management and Document Organization easy!. It saves and organizes any type of Text Data or Documents and keeps it in one program so you can always find it easily. No more searching through documents or your computer files and folders is required. Just open Time Saver Wolf and find what you are looking for in seconds! Then you can paste it into other applications, print it or just be happy that you found it again! Time Saver Wolf allows you to organize your Text & Document Data under categories that you create. You can design your own category tree to save and organize your information "your way". You are in control of how your data is organized. Simple to learn & quick to master. Create your own Category Tree Structure in seconds. Add an Item and Start Linking any type of File or Document Effortlessly. Create, rename or move Categories as needed. Organize almost anything from a List of your favorite recipes to important Financial Records and Files. Lets say you find a great chicken recipe on the internet you want to keep. Simply Highlight it using your mouse, Copy it (ctrl-c), Open Time Saver Wolf and Create a Category called "Recipes". Maybe create a sub category called "Chicken" and PASTE it (ctrl-v) into a new item. Now you know where it is, how to find it and its saved forever. Now lets say you have a bunch of Word documents, Excel sheets, PowerPoint presentations or just about anything. Create a category named "Documents". Add an Item named "Excel" and quickly link all your Excel sheets to it. Time Saver Wolf will even make a Copy of each document automatically and save it to your Documents Linking Folder. If you want to view, edit or print the document you just double click on it and Time Saver Wolf automatically opens the correct application to do it. Link multiple types of documents (pdf, Word, xml, txt, Images (jpg,bmp,gif) , Excel (csv), Access, PowerPoint, and many others) to your items. 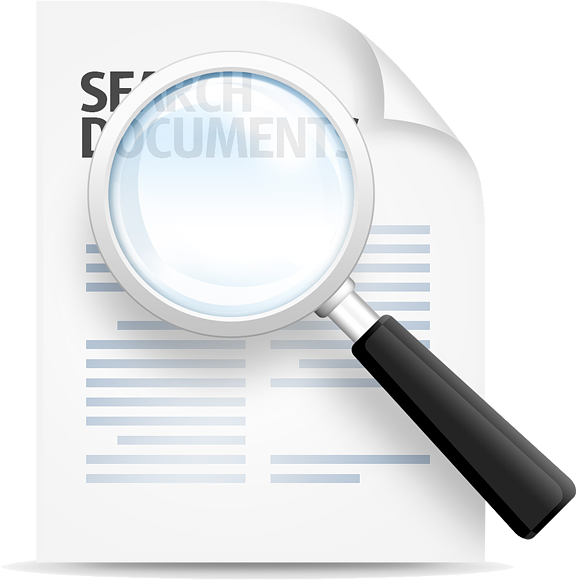 Unlimited documents can be linked to any item and viewed from Time Saver Wolf. Includes options to automatically make backup copies of your linked documents to keep your original data safe and make it easy if you move Time Saver Wolf to a different computer. Simply create a category and start typing in the Rich Text Edit control to save the text data or Copy text data from a different application and Paste it into Time Saver Wolf. The text will be saved and categorized for you automatically so you'll be able to find it again in a snap! Quick and Easy and you'll always know where you left it. Keeps Your Data Safe and at Your Fingertips! Utilizes a powerful relational database with unlimited capacity to keep your data safe. Create as many categories and sub-categories as you like to organize your data. Link multiple documents or images to items as you go. Data is organized using a "Category Tree" format that allows you to create, edit, rename and move categories as needed. Easily create categories and sub-categories for storing information. Move categories and sub-categories around as needed to reorganize it as you add more data to your database. It's designed with the flexibility you need to display the information in a way that meets your personal preferences. Incorporates a Rich Text Edit control (allows you to change the font, text color, etc) so that you can format the text data as needed. One click will Paste the formatted data into any other application that supports "rich text" and the formatting is maintained. (Most applications support rich text). As a software company we use Time Saver Wolf everyday to track and organize a myriad of data including customer feedback, bug reports and customer inquiries. Many of our users save and organize Word documents, recipes, business letters, birthday lists, to-do lists, favorite quotations, home assets, phone numbers, email responses, correspondence, classroom notes, mathematical formulas and much more! "What a great idea for a software program! I save and organize all types of things with this software." "I've been looking for a program to organize my recipes and your software is perfect! " Wow I love this software! I run an internet business and Time Saver Wolf allows me to easily organize my customer feedback and responses. " Great software for managing any kind of text. The category tree makes it so easy. Cool software. I use it everyday!."